Believe it or not, Easter is just right around the corner. 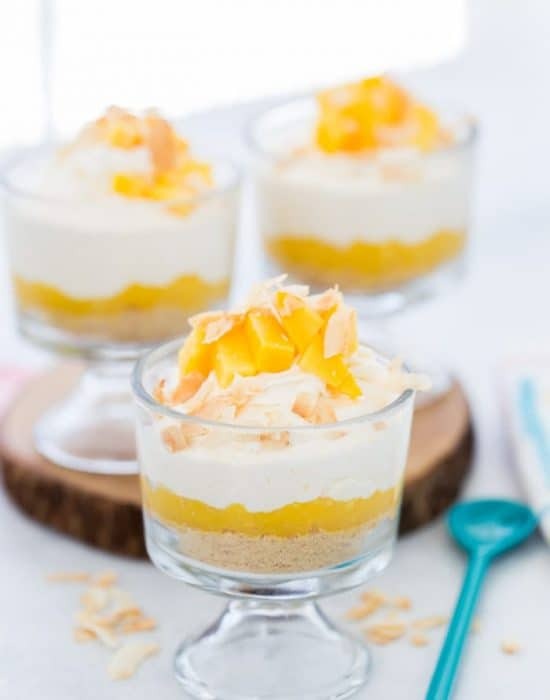 So it is time to start thinking of Easter recipes especially those that are easy to put together for large gatherings. These hot cross buns fall in that category. 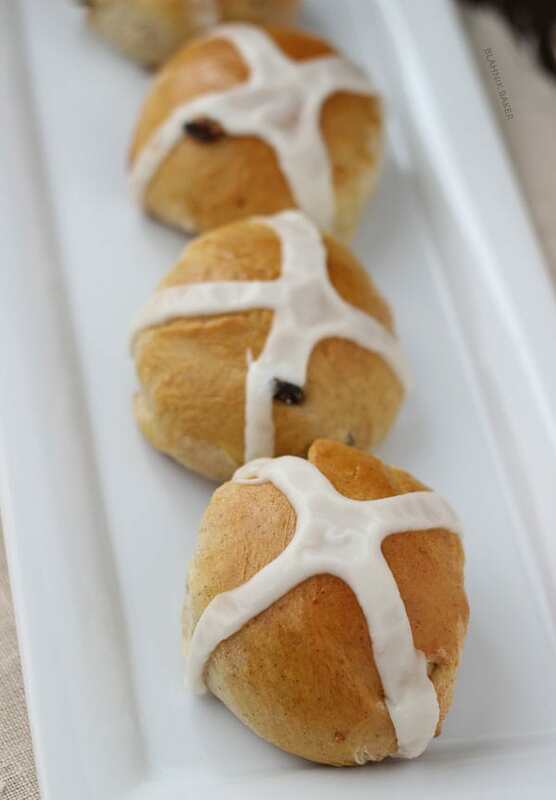 If you are unfamiliar with hot cross buns (as I was before the selection of this month’s cookbook for Pass the CookBook club), they are rich buns perfectly spiced with cloves and nutmeg that are usually enjoyed on Good Friday and over Easter. As usual for Pass the Cook Book club, our fearless leader Kita from Pass the Sushi selects three recipes from a cookbook collecting dust. This month’s book is Clodagh’s Kitchen Diaries: Delicious Recipes Throughout the Year and when I saw the recipes (Scotch Eggs, Hot Cross Buns or Three Cheese Ravioli with homemade pasta) we were to attempt, I knew I wanted to go for a real challenge. I could a) make something I’ve never made before (homemade pasta) or b) tackle that yeast-phobia that hangs over my head. I went with making some delicious traditional hot cross buns as you can tell and thanks to my friends over at Red Star Yeast, I was well armed with their amazing yeast products before starting. My stress level was at #2 (thank you guys!) and that’s needed for a first time bread maker. To be honest, I don’t know why I was intimidated by bread making. Making these hot cross buns was pretty straight forward once I played around with the recipe. 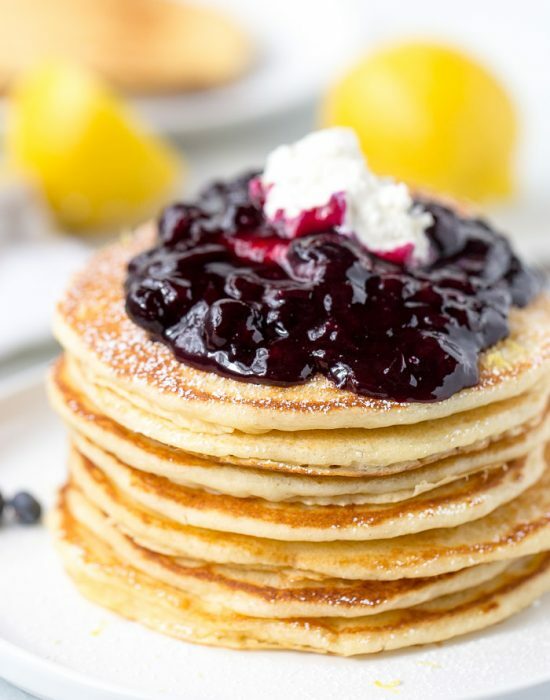 The original recipe from our cookbook was giving a few people some headaches so I opted to adapt it and go with suggestions from RED STAR YEAST. I’m glad I did because the buns are soft and sweet with distinct flavors of lemon, cloves and nutmeg on the inside and crisp on the outside. In a medium bowl, combine 1 ½ cup flour, yeast, cinnamon, cloves, nutmeg, salt, lemon zest and sugar. In a small saucepan, heat milk, water and butter to 120-130 degrees F. Add the liquid mixture to the flour mixture and beat on medium speed for 2 minutes. Add egg and beat for additional one minute. Add the remaining flour and raisins to make a soft dough. Using the hook attachment of your mixer, knead the dough until smooth and elastic on low for 3-4 minutes. Alternatively, knead on a floured surface until smooth and elastic, about 5-7 minutes. Lightly grease a large bowl and place the dough in bowl. Turn over once to coat with oil. Cover with plastic wrap and let rise in a warm place until dough doubles in size. About 2 hours. Lightly grease two 8-inch or 9-inch cake pans. Punch down the dough and divide into three equal parts. Divide each third into three equal smooth balls. Cover pans and let rise until an indentation remains after lightly touched, about an hour. Preheat oven to 375 degrees F. Make the glaze but whisking the ingredients together. Brush the buns with glaze. Bake for 10-12 minutes until golden brown. Immediately remove from pan and let cool completely on rack. To make frosting, whisk all the ingredients together. Frost the buns, making a cross on each bun. Here’s what everyone in the group made from our cookbook of the month;. These would be just lush to eat over the Easter period. I love hot cross bun minus the dried fruits with a cup of tea. I literally have to pick out the dried fruit. Yours look really delicious and i love cinnamon. Well done Zainab!!! 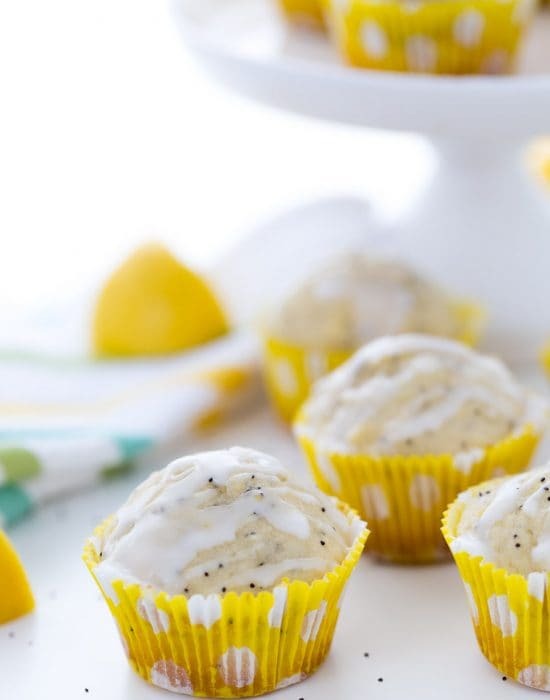 Such a classic Easter treat…love that you made these and are conquering your fear of yeast! Yayyy! isn’t bread baking the best? Way easier than people expect! These buns look so amazing! looks so soft..im so glad it turned out great for ya. 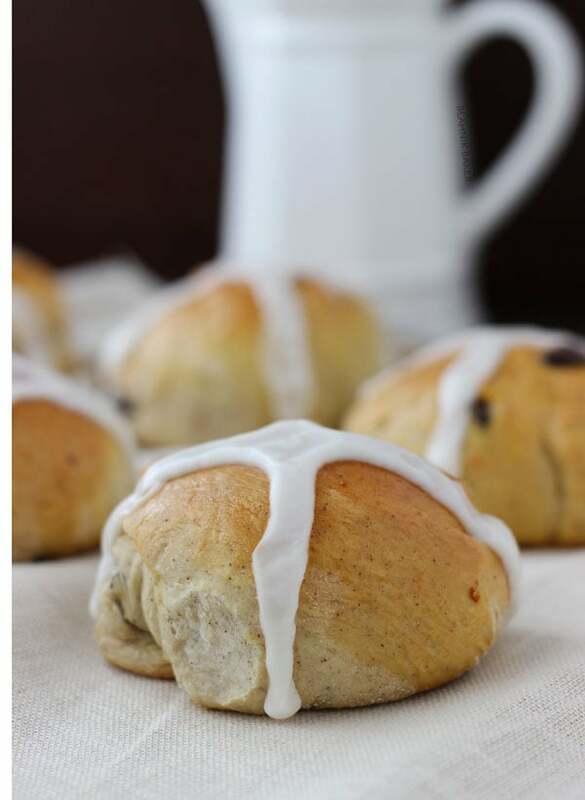 You totally read my mind with this post…my friend JUST asked me to make hot cross buns for her! Yours turned out so well. And welcome to bread baking – you are going to love it!! And totally rock it. I don’t celebrate Easter so I never know when it is, and I didn’t know this was an Easter dish! Looks great. I’m so glad you’re getting over your fear of baking bread/with yeast! You’re going to love it. Baking bread at home is the best…seeing the dough come together, watching it rise, smelling it bake in the oven…and then that first taste of warm, crusty, soft-on-the-inside bread. It’s like magic. Ok, I’m a little too obsessed with bread baking, lol. These hot cross buns look perfect, Zainab! I’d never have known this was your first time making them. Can you believe I’ve never eaten them or made them before, even though every year around this time, about a zillion bloggers feature them? 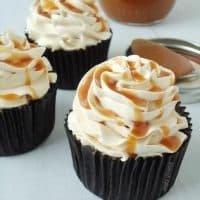 I should try your recipe because these look delicious! Nancy, I want that feeling you described!! I was very happy with these buns but I am looking forward to make a real loaf this week. I might call upon your expertise when I go pulling my hair lol! Oh these so delicious! My mom used to make homemade hot cross buns every Easter. I’ve tempted once since she passed away to carry on the tradition but mine were a flop. I’ve had a big fear of bread making!! I think you’ve inspired me to give it another go! I am going to follow your recipe this year. Wish me luck! I LOVE hot cross buns. Yours look so fluffy and delicious! These little buns are so cute. I went with the Scotch Eggs. No recipe problems with that one but still a weird dish to eat. What beautiful hot cross buns! I am glad you are conquering your yeast fear. It isn’t so scary anymore is it? No it doesn’t look like it but it could just be beginners luck so I’m crossing my fingers lol. Every now and then when the moon is right and I bust out a killer yeast recipe that just comes together, I wonder why I don’t bake bread more often… and then there’s these recipes 😉 Where I am 3 times at bat and still striking out. I am really glad your changes worked and that you made amazing looking Hot Cross Buns! I love hot cross buns! Unfortunately, the last couple of Easters I waited too long to make them and then Easter had already passed. I hope to make some this year! It’s time to get started on these! You will make it this year lol! I don’t recall seeing hot cross buns in the South, but up here they are everywhere! I got addicted to the homemade version last year, though…I can’t wait to try your version here! #yum And now that you’ve conquered rolls, I expect to see some nice loaves coming out of your kitchen soon!! David I have one of your loaves pinned and I’m making it soon to carry on this goodluck!! Red star yeast is the best! I’ve never made hot cross nuns either, but now I’m inspired! They’re mentally melting in my mouth right now … your photos did their job well! Congrats on staring down your fears of yeast and conquering it — these hot crossed buns look just perfect! 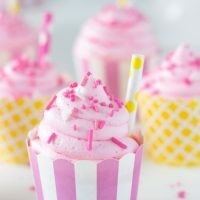 I would love to make these for Easter. 🙂 Have a great weekend! Your buns look great (I mean the ones in the photos) lol. Perfect for Easter! Ohh wow, I love your version of hot cross buns! The lemon and cloves sound like a lovely addition! 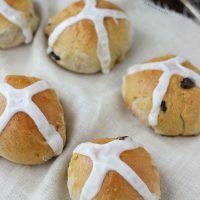 I made hot cross buns a couple years ago and loved them! 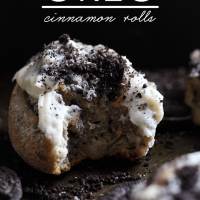 These have me wanting to whip up another batch. They look amazing! These buns are looking fabulous !! Winnie I wish I was that comfortable with yeast. But these buns are making me want to go back for more! I LOVE hot cross buns and we bought our first dozen this weekend so I can freeze them for the week. 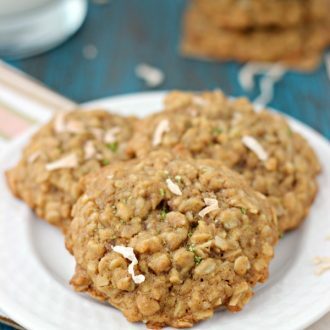 I have never tried making them though, so thanks for your recipe! G’day! I’ve never made hot cross buns but might have to put them on my list to do! Yes you would be able to!! Those look so phenom girl! In love! I was so afraid to attempt these but you definitely pulled them off flawlessly. These remind me of ones we had when I was growing up. 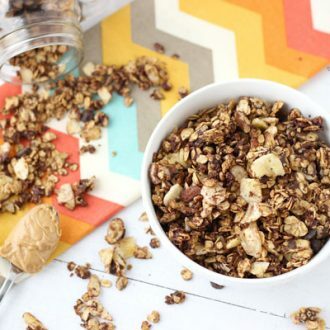 Thanks for sharing with us at MM this week – pinning! Thanks Amy!! I am so enjoying playing with dough!! 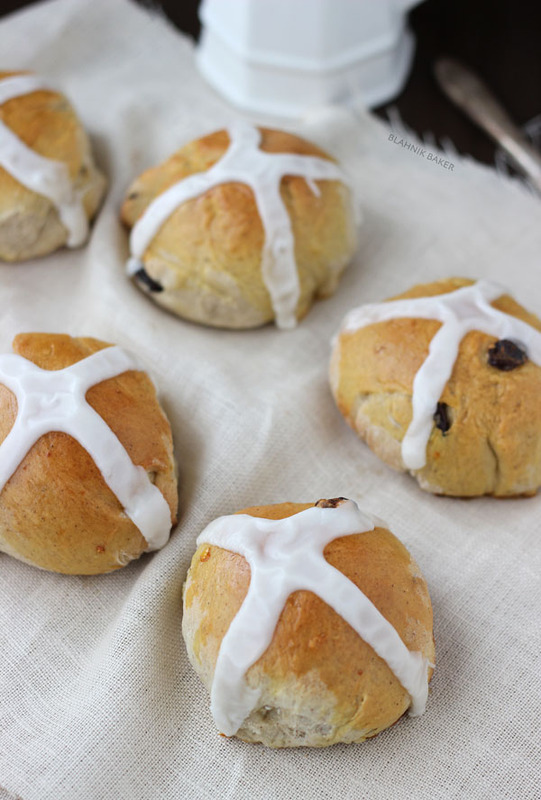 I have always wanted to make hot cross buns, but have yet to attempt it! I love the combination of lemon + warm spices. Yours are pretty as a picture! 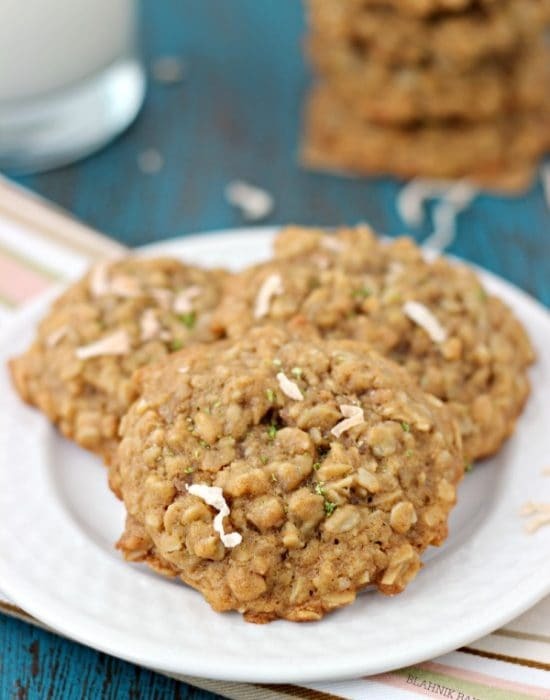 I’m pinning, and hope to follow your recipe soon. I’ll have to get my hands on some of that Red Star Yeast- thanks for the tip! Thanks Aliie! This recipe was very easy to follow and the bread was so flavorful! !